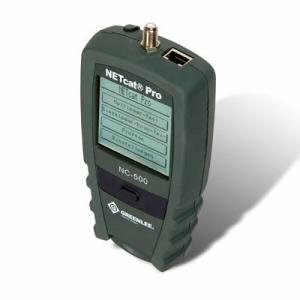 The NETcat Pro NC-500 troubleshoots and verifies a wide range of network wiring. It generates four distinct, precision tones for tracing low-loss cables like Category 5 and 6. The troubleshooter can detect shorts opens reversed, crossed and split pairs andidentifies active network devices (PC or Hub) on 10/100 Base-T networks. Network device capability. The display language can be set to English, Spanish, French or German. Using a fingertip or the built-in stylus, the back-lit graphical touch screen display can be used to control a range of tests from fault finding to time domain reflectometer (TDR) length measurement. The true TDR shows length of each pair for distances between zero and 2000 feet. When used with the seven expansion remote test modules found in the NC-510 Accessory Kit, the NETcat Pro can uniquely test shielded or unshielded twisted pair and coaxial cables from a central location eight at a time. The NETcat Pro NC-500’s remote units uniquely identify each jack, and provide full wire-map and fault display in addition to the length of each pair. Network cable tester designed for fast, accurate checking of cables, wiring and network service. One touch testing verifies network cabling and service. Detects shorts, opens, reversed, crossed and split pairs. Identifies active networks devices (PC or Hub) on 10/100 base-T Networks. Tests UTP and STP Wiring and coaxial cables. TDR shows length of each pair for distances between zero and 2000 feet. Touch screen display with contrast adjustment and backlight. Generates four distint, precision tones for tracing low-loss cables like cat 5. Identifies active network devices (PC or Hub) on 10/100 Base-T networks. Office identification using remote ID units. Troubleshoots and verifies a wide range of networks. Remote jack ID and verification. Operates on a single 9V battery, with low battery indicator. Pulsed time domain reflectometer (TDR) shows length of all pairs. Compatible with precision digital probes.